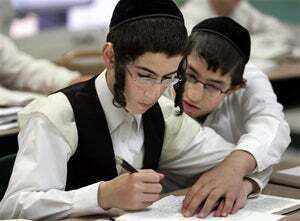 Is There Truth To The "Smart Jews" Stereotype? My Jewish grandmothers would love to read this "Jewgenics" article, where Slate's science guy William Saletan discusses the biological and sociological back-up behind the Jew grandma-approved stereotype that the chosen people's intellectual prowess is above the average and ponders whether Jews are a race, culture or ethnicity. While Saletan never comes to a definitive conclusion about what Jews are, he does quote some impressive statistics such as, "The average IQ of Ashkenazi Jews is 107 to 115, well above the human average of 100," and the Ashkenazis have an average score of "122 on verbal IQ tests." He also notes the Ashkenazi predisposition towards poor spatial intelligence and potentially life-threatening illnesses like breast cancer and Tay-Sachs. But the part I found most interesting as a non-Jew loving Heeb is that "the rate of Jewish 'outbreeding'—procreating with non-Jews—is half a percent. That's the lowest rate of any population in the world today." A culture that trains its young people to procreate only with one another becomes, over time, a genetically distinct population. And if that culture glorifies intelligence to such a degree that it drives less intelligent people out of the community—or prevents them from attracting mates—it becomes an IQ machine. Cultural selection replaces natural selection. Wait, so am I attracted to WASPs because I'm secretly intellectually inferior? Does my alleged stupidity keep me from snagging the nice Jewish boy that my mother always dreamed of? Or am I just a cultural renegade who wants to keep her potential offspring from crappy spatial intelligence inspired klutziness? Also: don't you find that "half a percent" statistic dubious. My friend group is teeming with half-Jews and I can't imagine that they're a complete anomaly. Finally, it's hard to buy into the high Jew-Q hype when we claim bright lights like Katie Price (Jordan) and Bush crony Paul Wolfowitz as part of the tribe.